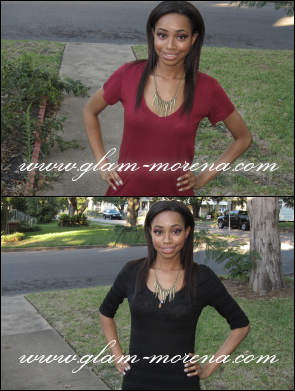 Glam Morena: Haul: StyleMint + Get 10% Off! Haul: StyleMint + Get 10% Off! I'm sure you all have seen me mention JewelMint a few times on my blog or Youtube channel. Well there's a new monthly subscription site called StyleMint. StyleMint offers t-shirts, which are created by Mary Kate and Ashley Olsen. The same concept and same prices still apply for this website too. I find $29.99 to be a bit pricey for basic t-shirts, but that could be because I'm cheap when it comes to clothes. 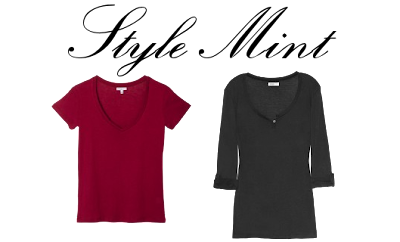 I ended up receiving two shirts: StyleMint Abbot Kinney in Cabernet and StyleMint Melrose in Black. I decided to go with a size 2 for each, which is a small to medium. I definitely should of went with a size 1 and I will remember that next time. Have you tried StyleMint? Thoughts? I haven't tried Stylemint. If I were into wearing t-shirts, I'd check it out. I have thought about Jewelmint, though. I was looking into StyleMint and I am not too interested in signing up. Like you said, $29.99 for t-shirts is a bit much. I am also cheap. haha!